Though incorporated and headquartered in Yukon, Proskida, as is common with technology innovation companies, is in fact a nationwide and even international effort. Alastair Smith, who first came up with the idea, lives and works in the Yukon. He serves as de facto project manager and coordinator; his partner, Hans Fischer, lives in Toronto, and serves as the lead on the development of the grip itself; Northmark Ventures (itself a company based on a partnership between Whitehorse and Vancouver based enterprises) supplies some capital and other business support. Beyond those three partners, there are contractors for firmware development, data analysis, mechanical engineering, and sports physiology—all these scattered all around the country. And then there are the paid product testers, some of them international. Given all these nationwide and international connections, the question inevitably comes up: Why is Proskida based in the Yukon? 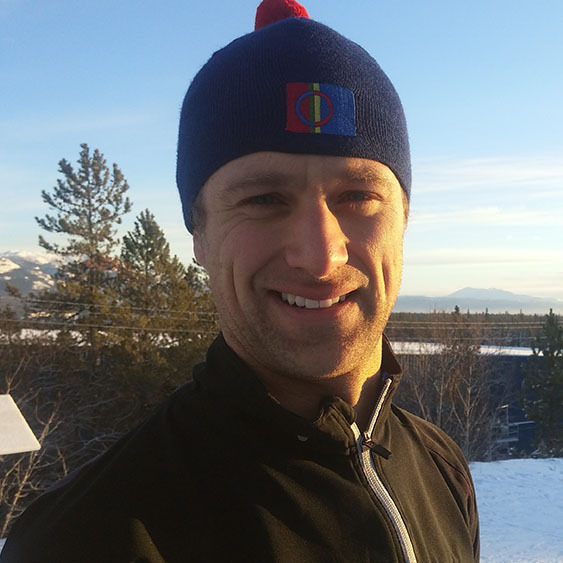 It was through a shared involvement in cross country skiing that he and the other early co-founders arrived at the gap in cross-country performance analysis, and a way to address that gap. Some of the early players in that process have since moved on to other things, but the idea itself has gone forward over the past few years, and remained based in the Yukon. There are more than just life-style benefits to a Yukon location, though. The quality of skiing facilities in Whitehorse, and the past performance of Yukon skiers in cross country competitions, give a Yukon-based company in this business a certain amount of first-glance credibility, at least nationally. And, while most European ski athletes and coaches may not know where the Yukon is exactly, the fact that Proskida is based in Canada, and in a region synonymous with cold and snow, also provides credibility. On top of that, the direct relation with the local cross country skiing community has led to many valuable networking introductions. It was through local skiers that Proskida made its first connection with Cross Country Canada (the national cross country skiing organization), and subsequently with Swiss Ski, its Swiss counterpart. Additionally, mentoring and other support through TechYukon and the Yukon government Department of Economic Development have been important in helping the company get past many of its initial hurdles. Alastair was a member of the first group of startup companies to participate in TechYukon’s Startup Checkpoint event in February of 2016, and over the past year and a half or so has benefited from access to business development services from local and BC-based mentors. Of the Startup Checkpoint event itself, Alastair says that the opportunity to have an entire weekend to work through a business-case reality check and pitch development exercise was very helpful. The pitch has developed considerably since then, but getting both the time and assistance needed to develop that first version has paid dividends. Furthermore, the advice and out-of-territory networking connections that come from the follow-up mentoring have helped a lot. The involvement of Northmark Ventures, for instance, came about thanks to that process. Proskida is now looking to raise outside capital in the near future, and is, by Alastair’s assessment, a few minor iterations away from having a manufacture-ready version of its pole grip in place, probably for by-hand assembly locally. The data analysis and reporting component is also under development in a parallel stream. Those are the near-to-medium term objectives, right now. As for the future, Alastair believes that the smart pole grip, though very important to Proskida’s entry strategy, is likely over time to become only one part of a much larger sports-data acquisition and analysis service. Sports training across the board is becoming more and more data driven, so getting in on that action at this relatively early stage is important. Ultimately, Alastair thinks, the new generation of coaches (likely much more data-driven than most of the current group) may prove to be at least as important as the athletes. He can envision coaches getting real-time feeds from a number of input devices fed to their tablets, and using big-data computation to both improve and speed up their coaching results. Better reporting and analysis will mean more effective work done more quickly, so time for more athletes or more advanced training. For the present, Proskida is getting ready to push off on that competitive race—a local idea, partnered with national skills and resources, and going global.